Preston is a certified personal trainer, health and fitness enthusiast, and freelance writer/content marketer. Each and every year, more than half of us make the same common resolutions-eat healthier, get more exercise and save more money. Studies have shown that less than 25% of people actually continue to pursue those resolutions after February. Why are most of us shelving these resolutions each year? It's simple, work, work, work... 8 hours, 10 hours, 12 hours, 16 hours a day. Add in life and family commitments and its no wonder why the excuse "I don't have time" is the primary reason we don't get to the things that need attention in our lives. And that's just the typical working person. For those of us that have to travel occasionally for work, the lack of time gets compounded with the lack of space and resources. If one of your resolutions was to get more exercise, you're probably already doubting yourself. Especially if you've already started or had work trips planned for the first 90 days of the year. So, now what? Quit again? How many years in a row is that? There are ways to keep going and it's not as costly or inconvenient as you may think. So what do you do if you travel a lot for work? You could join a gym franchise like Gold's Gym, Planet Fitness or L.A. Fitness and have nationwide access. If you already have that membership, great. Hopefully, your employer allows for a rental car with your per diem. Now it's up to you to stay motivated to go. If this isn't an option, keep reading. Then there's the matter of the hotel fitness center. In most cases its fairly easy to presume the fitness center is nothing more than a treadmill or two, an elliptical or two, about 50lbs in dumbbells, and maybe a couple of bosu balls. 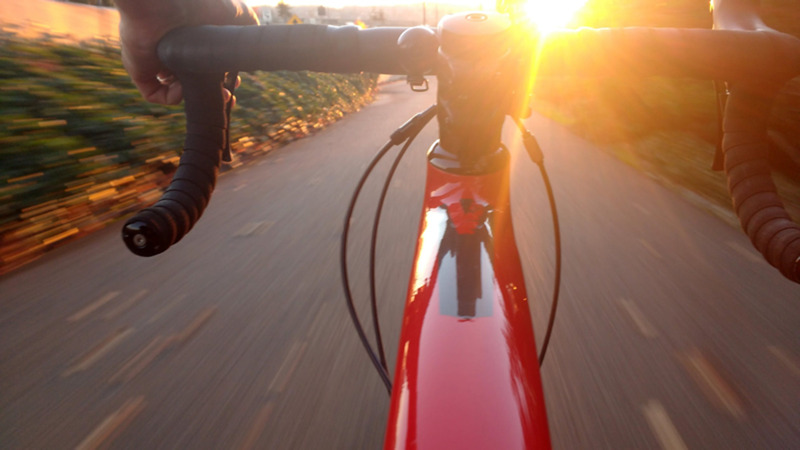 A treadmill, elliptical or bike is great if getting more exercise was the only goal. If you're trying to build muscle, you're going to need more. 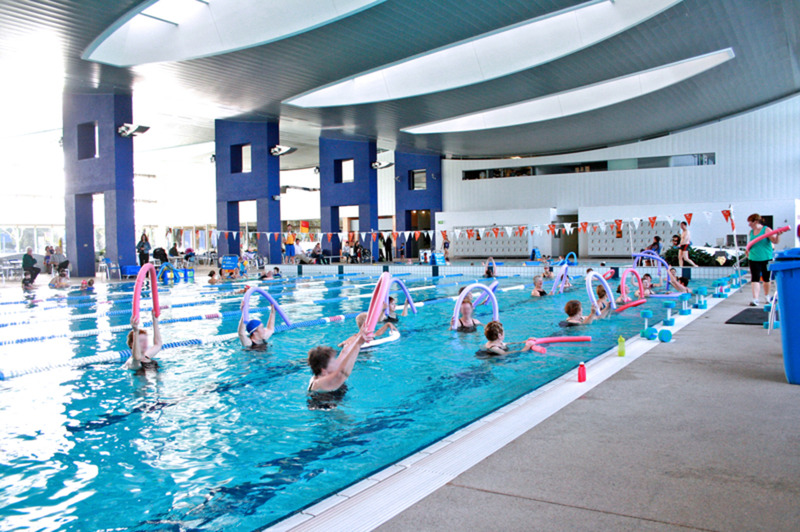 Many hotels are improving their fitness centers. However, if it's only advertised on the hotel's website as an afterthought, it's probably not great. So what do you do? Here's an idea that will cost you $100 or less. 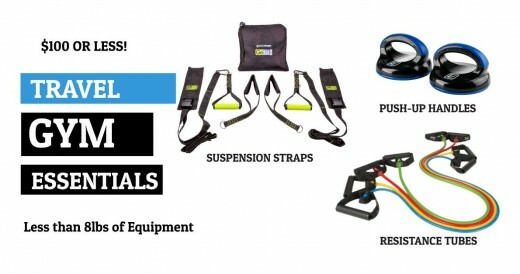 You only need three pieces of equipment; a resistance band/tube set, rotating push-up handles, and suspension trainer straps. Simple; Easy to pack for trips; Efficient. 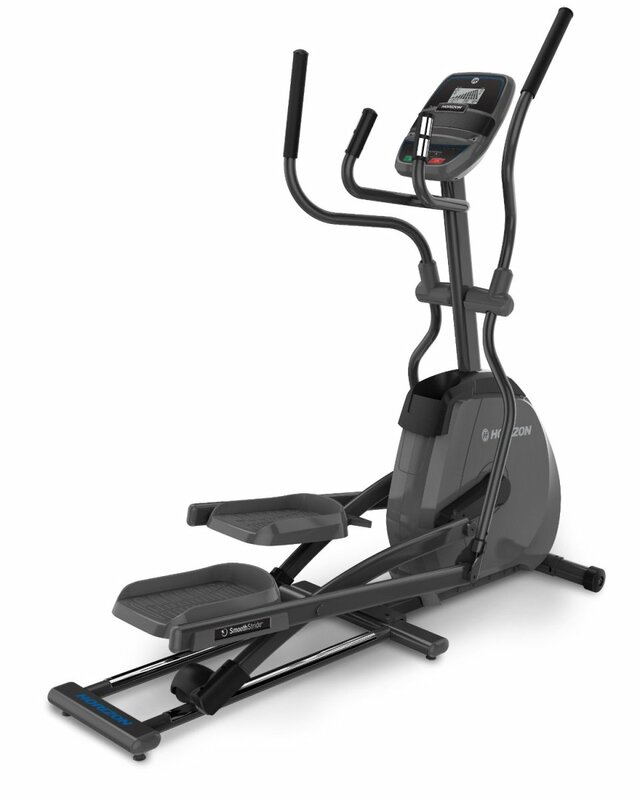 This triad of equipment, even in a small space, can put you on your way to turning that resolution into a habit at home and on the road. The complete set weighs just under 8 lbs and doesn't take up much room in a suitcase or duffel bag. You can target nearly every muscle group with a minimum amount of equipment. It's possible to achieve great results using your body weight and band resistance to maximize the strain your muscles need for growth and development. Just about every type of exercise movement can be recreated using the bands and/or the suspension straps. 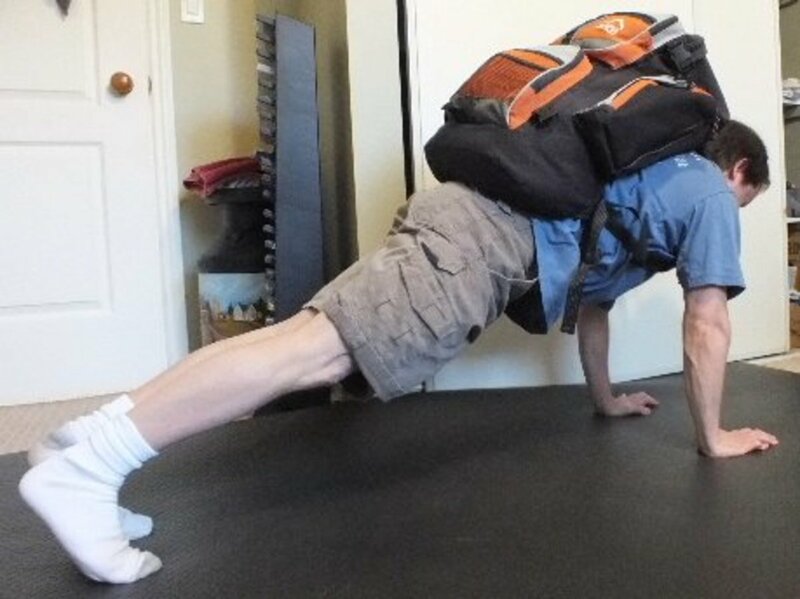 You can do pushups at various elevations and arm positioning to hit the chest. 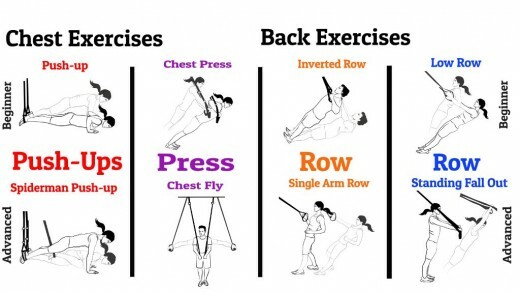 If you want to focus on your back, simulate the rowing machine by anchoring the suspension straps or resistance bands above a doorway. You'll either pull yourself up, similar to a pull-up or pull the resistance bands down, similar to a lat pull-down. A complete routine can take as little as 30 minutes 3-4 times a week. 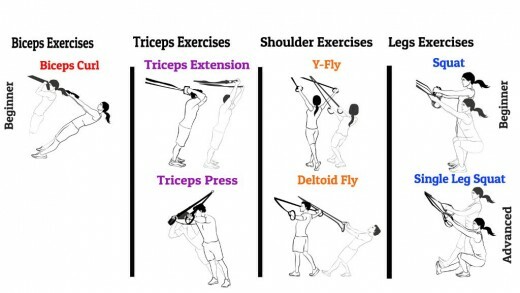 Below are some graphics with a few exercises to get your routine started. As your body gets into better shape, increase the speed or resistance at which you work to maintain the fat burning level and resistance challenge. It's recommended to move away from the bands and on to weight training whenever possible, in order to keep the body guessing. As a reminder, consult your physician before getting started in exercising in your home gym, outside the gym or any exercise program for that matter.